This dress was originally made for my DnL, when she was pregnant, way back in 2017. She had thoughts of wearing one of those slim fitting dresses with all the ruching up the side, in order to reveal the bump that was soon to be my grandson. I made three dresses for her, all in one week, trying to get the look she wanted, before I realized, that I was not a "forever 21" mass production line. I finally decided to just make a simple wrap dress using this matte rayon jersey fabric in black. I was so happy she didn't like this one! What was I thinking!!! I guess you could officially call this one a "save", since I drew it from a pile of lost souls, aka UFP- Unfinished projects, just in time to cut the pleated/gathered side seams off and slim the dress down to my waist size, stitch the hems and get out the door for our family Christmas Party. I was intending to make a cute dress with that buffalo plaid you see around my neck, but I just plumb ran out of time. The dress is a simple tee-shirt dress designed from my basic dress block. I figured it should be easy to just throw together a dress with some ruching up the sides, as she had requested. The original dress was made with added length up the sides to give it the pleating she wanted. The neckline was made simply by creating a binding from the self fabric. 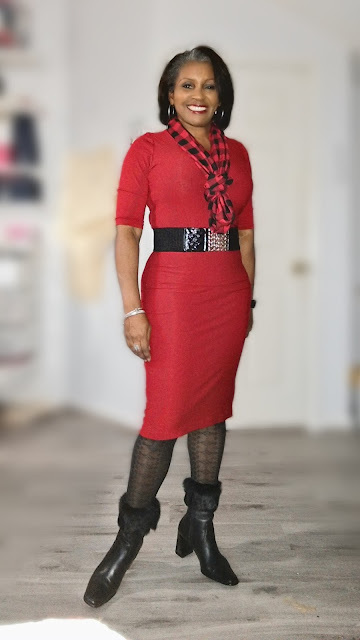 The length turned out just perfectly for the look I was hoping for, since I had wanted a red column dress for a while now. The sleeves are the perfect length for any occasion. Pattern: Self Drafted from my dress block, sold here. 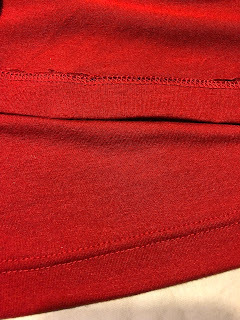 Fabric: Torch Red Rayon Knit Matte Jersey from Sew Much Fabric. 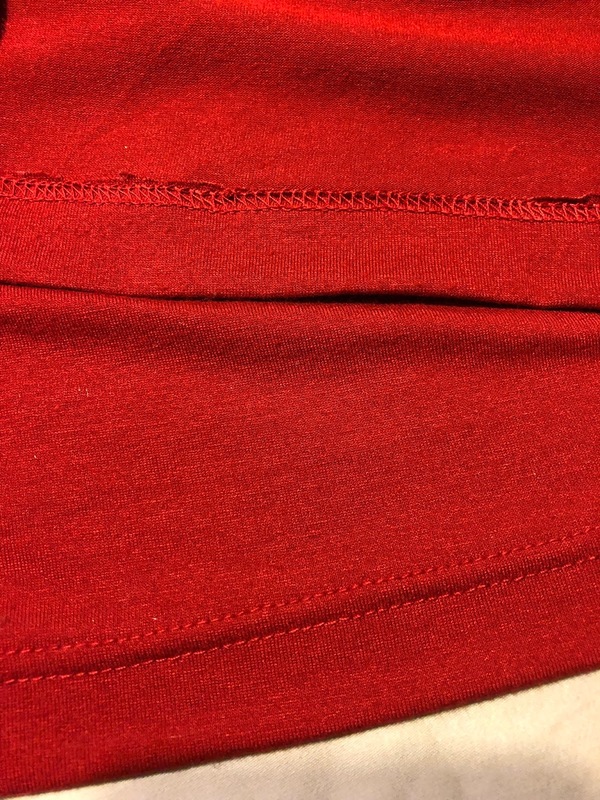 Finishing: I finally decided to use my cover-stitch machine to hem my knits. What took me so long, I have no clue. I think we become so set in our ways, that the thought of learning something new scares us. Well, at I think that's the case for me. The infinity scarf was made from a rayon poplin that I got from my local fabric store, High Fashion. I used this fabric to make three other dresses for the family's buffalo plaid themed holiday party. More details to follow on my regularly scheduled Sewturday Night Live WebCast. 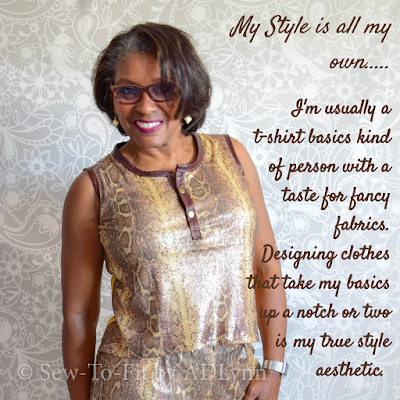 I teach virtual sewing, pattern fitting and design lessons. Go to my lessons page for more details. This is the fourth year I'll be sewing my family's holiday gifts while Livestreaming. I cannot believe how many years I'd been doing this, and neither did I realize, you all were looking forward to my live holiday sewing chats. 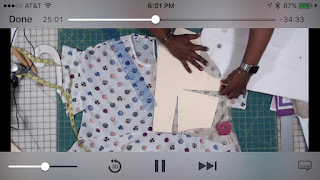 Back in 2015, I choose to make a habit of sewing #Sewtofitlastminutegifts, while livestreaming in an effort to avoid rushing out into the stores to shop. So, this year, I'm embracing that which is me, and inviting you to join the fun. 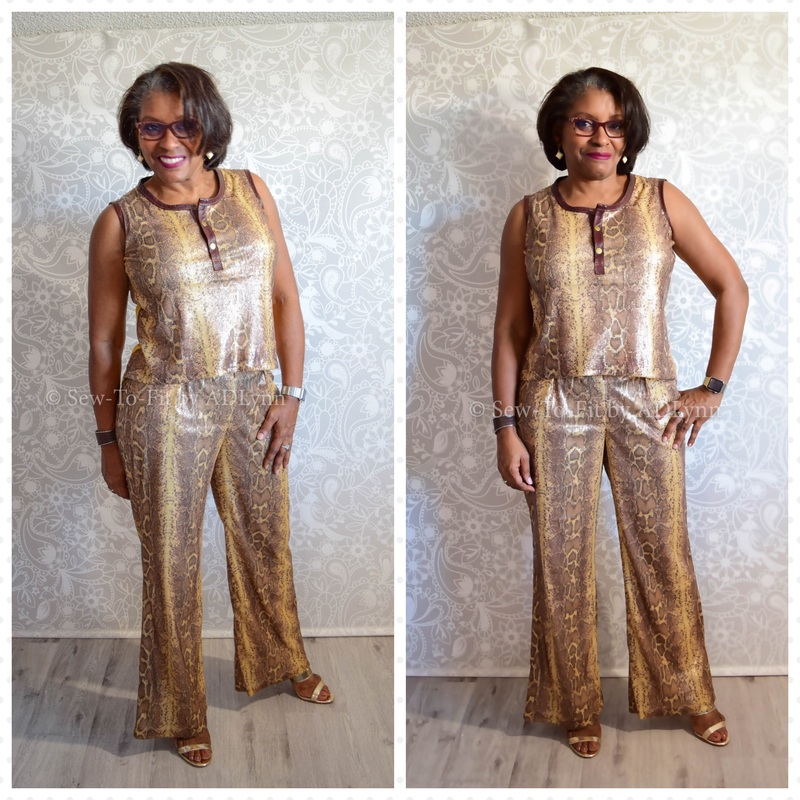 I will be "Sewing While Live" this Friday, 12/21 @8pm CST, and want you to join me! 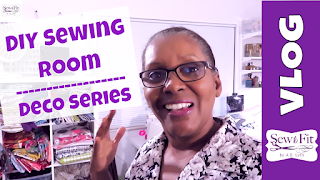 Let's see how many hats we can make in a couple of hours, as you sew-along with me while I broadcast Live as I sew my #SewToFitlastminutegifts on my YouTube channel. I challenge you to prepare your list and gift bags as well, since you never know how many you may need for those last minute parties. Personally, I know I'll need at least 7 for sure! Whew!!! It's about the same every year, so I'm always ready with a manufacturing style setup. 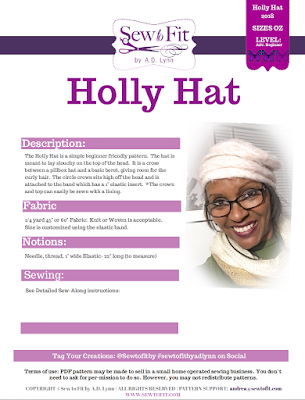 The pattern we will be using is the Sew-To-Fit Holly Hat. 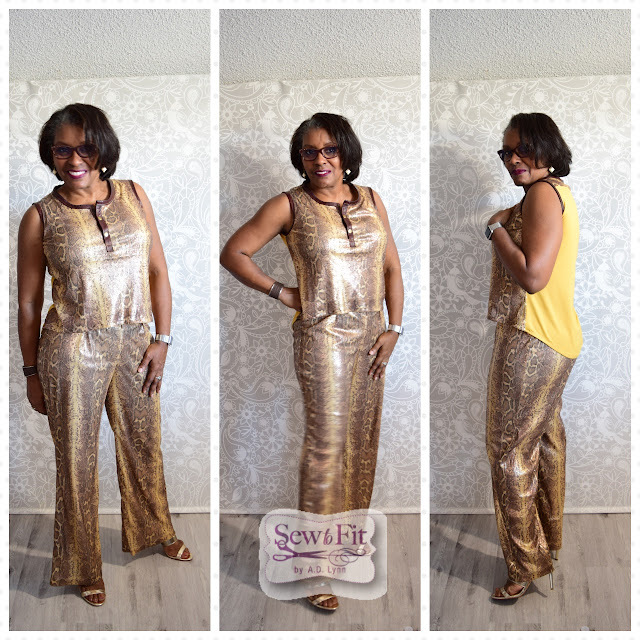 The SewToFit Tribe subscribers were sent the Free Pattern Download via the newsletter, on Monday, 12/17. If you haven't already seen your email, make sure to check your spam folder!! If you are not a "Team SewToFit" subscriber, or haven't already received your pattern and want to participate, download your pattern here. You will be automatically signed up for the email list when you download the pattern. The "FREE Pattern" Code is already applied for you at checkout. The fun starts at 8pm Central Time(USA) on Friday, December 21st. 2018. You will be able to ask questions in the live chat, as I sew-along with you to get these out. I'll also be giving sewing tips. Make sure you wind your bobbins!! We will be moving fairly quickly to get these done. 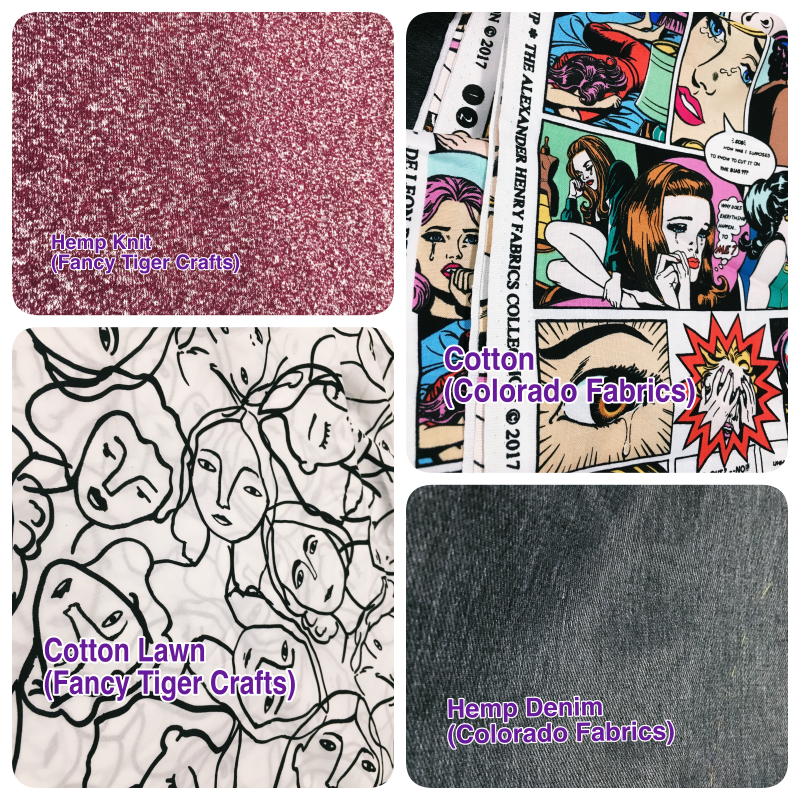 I will demonstrate the cutting and sewing from start to finish, but I plan to have most all of them cut out and ready to sew. Here are a few tips to help you make the best use of your time and to get the most done. NOTE::: If using a woven fabric, you will need to make different fitting considerations. Have all your different fabrics cut out in coordinating colors so you won't need to change thread colors. Cut all your pieces and label them together for each hat. NOTE: Lining: I lined my hats, so my pieces 1-Crown top and 2-crown were cut twice. Wind multiple bobbins and have ready. (You can use serger or regular machine.) The grey hat below is a knit and was sewn completely on the straight stitch machine, with a 3.0 stitch length only. NO zigzag. Cut the Band the length needed and adjust the lower crown as needed. (This is the only item which creates the sizing. The pattern is ONE SIZE for ALL. Consider the fabric bulkiness if using sweater knits. 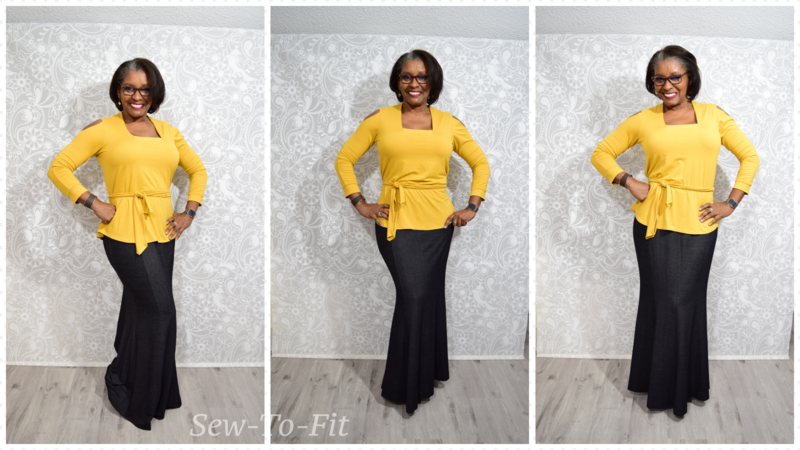 I have researched an article for you on how to sew bulky sweater knits...(not my expertise) Check out O'Jolly's article. Use a rotary cutter and a cutting mat to save time pinning. I am using fleece (unlined) as well as other lightweight knits and sweater knits. Be sure to check out O'Jolly's article if you need help with the sweater knits. Well, that's about it for now. Make sure to set your reminder for the Livestream notification. Please remember to use the hashtag #sewtofitlastminutegifts and tag me in your pictures @sewtofit. Thanks for a great year!! After a year of working through the process of wardrobe education and planning, and learning to understand color as it relates to my taste and style. 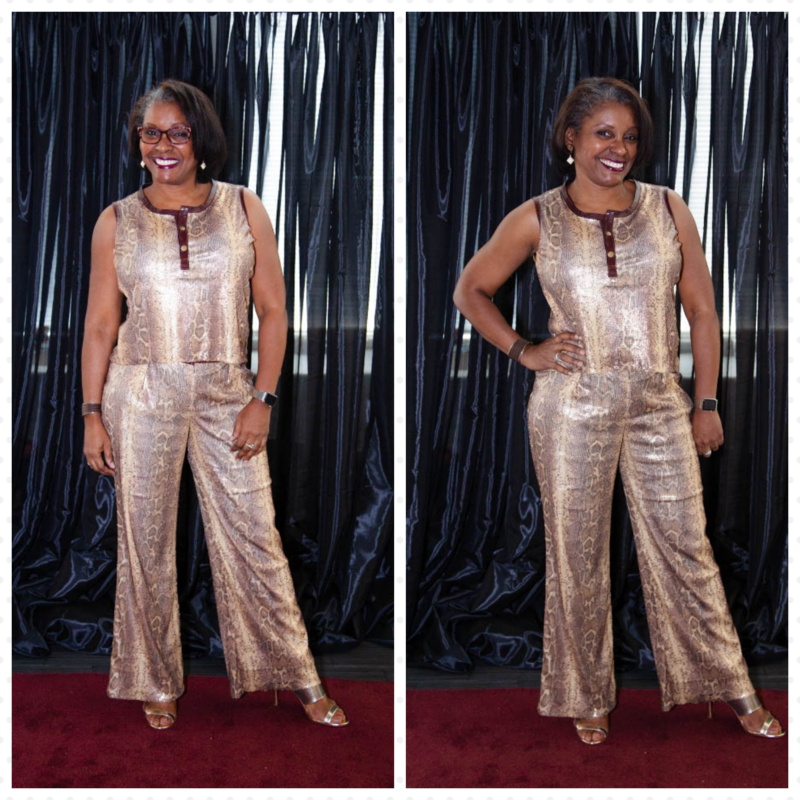 I came out of the year long "Sewing With a Plan" process with a deeply renewed sense of confidence and trust in my choice of clothing, whether I make the garment myself or purchase ready to wear. I had no clue what my style was, I would just make whatever came to mind, or across the "inter webs" with no direction for how it would fit into my wardrobe life. We learned to understand style and aesthetic from our Wardrobe Consultant, aka, Roz of Sew Much Fabric. She taught us how to pinpoint our personal style esthetic and taste in clothing, and evaluate our lifestyle or wardrobe life. Mine turned out to be my all time favorite: Bohemian, aka BOHO. My secondary style aesthetic, "Urban Chic" came as a surprise to me, not to mention I didn't know what it entailed, let alone, how it looked. I realized how exacting these two styles were for me when I began creating my own mood board via Pinterest. To end the year, we were challenged to make an outfit that represented our style aesthetic to show at our annual Holiday celebration. This year we celebrated with a Style Runway Show. I made this sequin outfit to represent my taste. Making this outfit came naturally, and this gifted fabric choice from Roz a year ago, (#notsponsored) was instantaneously decided upon as soon as I got the email instructions. Admittedly, my first thought was to make a jacket, but, I'm glad I changed my mind and went with this casual pant set. The fashion show was a huge success! As my commentary was read by Lauren of LFB Color, our Color Strategist, during my "Runway Walk" I felt like a superstar and was extremely comfortable. 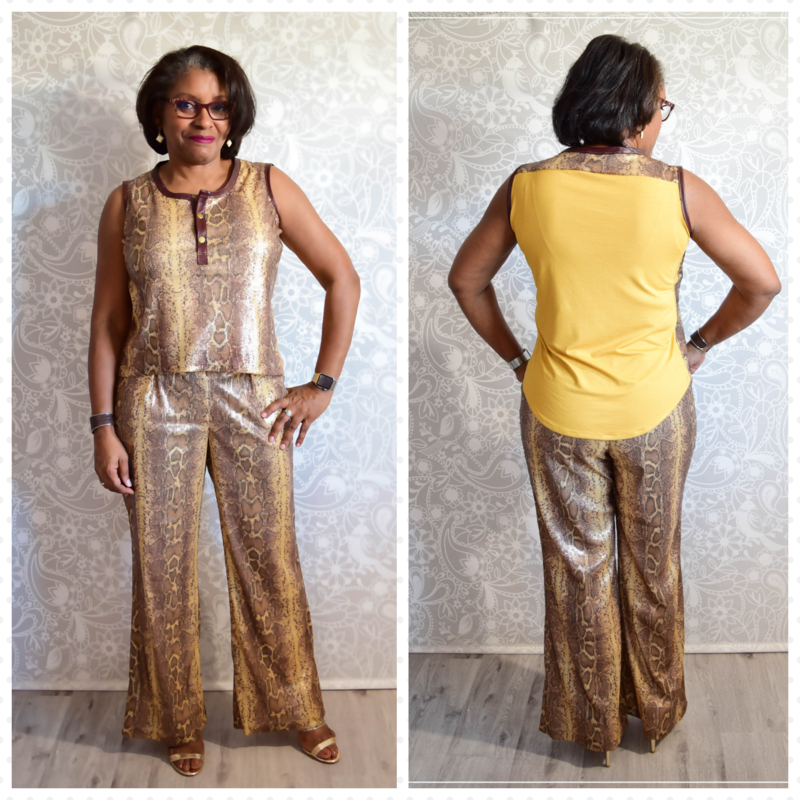 "Sewing of The Snakeskin Sequin Pant Set"
Pants- python sequins lined with tricot nylon has back yoke and leather waistband. Tank Top- python sequins underlined with tricot nylon on front, back is a 11oz Rayon Jersey. The front placket and bindings are an calfskin leather I got on a trip to Florence, Italy. These pants are the same pants I made in the blue velour set that you all have fallen in love with on my instagram account. They were my original wearable muslin/test pair which I designed. Because, project included so many construction elements, and fabric combinations, I made sure to document the entire sewing and making of this outfit, along with my Runway Walk on my youtube video. 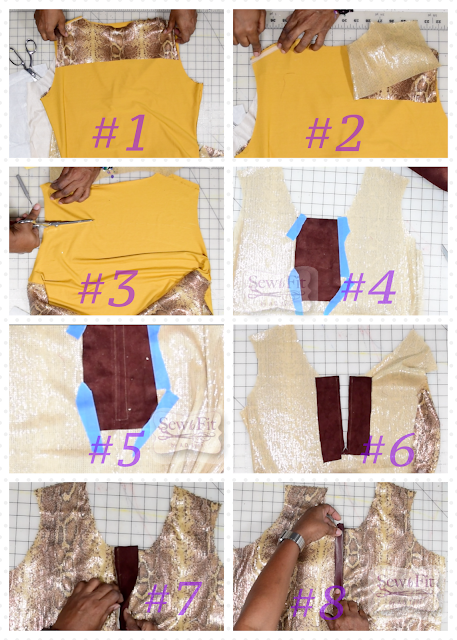 Here are a few video screenshots to give you an idea of how easy it is to sew this combination. I decided to add the sequin yoke to the back along with the rayon jersey in order to balance the look. Cut the section out for insertion of the sequin yoke. I used painters tape to hold the leather in place while sewing. Folded it in place for topstitching. 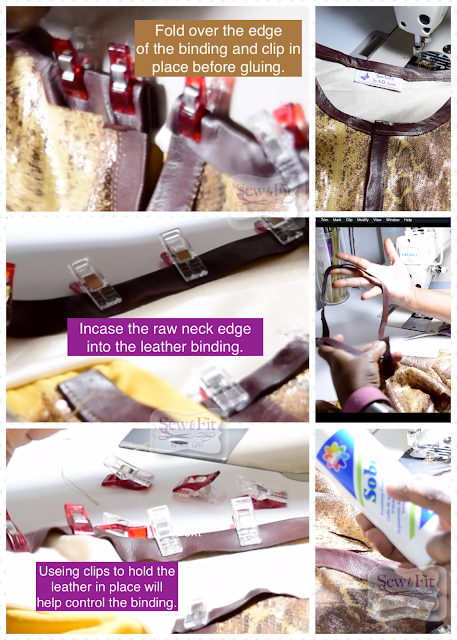 The video includes the neckline details and how I used the Sobo Glue to adhere the leather in place before topstitching all the bindings onto the neckline and armholes. I originally wanted sleeves instead of having the top sleeveless. Well, that didn't happen, because I forgot to included much needed ease when I used my "knit block" to design a "non knit" sleeve. I should have used my basic block pattern to design the sleeve. The leather binding turned out to be a better choice in the end. For the pants, I didn't want to utilize the fabrics' stretch for the waistband, because I like to have my waistband fitting really, really tight. In that case, I did the waistband in leather, and added an invisible zipper, with a wooden button. I left all the edges of the leather raw. I am very satisfied with my outfit, and will be able to switch it up anytime, to wear the top with jeans or other pants, and the sequin pants, I could easily wear them with a silk blouse and jacket to turn it up. My sewing has changed tremendously after this experience. It is much easier to decide what to make and I just don't stress anymore about what others are sewing. I am in my own space and I LOVE IT!!! Until next time, see you on the other side of the internet! I just wanted to let you know about the changes going on in Youtube that will make it easier for you all to know what's happening with the videos. The Hat Pattern for our December Holiday SewAlong is almost ready! Join in the sewing fun with me live on, Saturday night, December 22nd at 8pm Central time. You will have more information for downloading the free pattern on Saturday if you tune in, otherwise, it'll show up here on the blog the following week before the SewAlong. 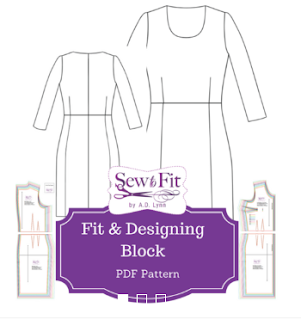 This version is the main version of the pattern with a sleeve hack and sash upgrade. 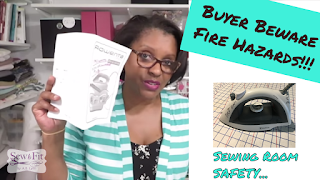 I detailed this hack on my last "Sew & Chat" on my youtube channel. Instead of sewing the sleeve as the two piece with the split as drafted with the tie ends, I changed it up a bit. The original pattern, as with this version, is well fitted at the bust-line and softly drapes out at the waist for comfort with a shirt-tail hem in the front and back. The ties were added to the waistline so that I could have a sewn-on sash to give the affect of a peplum top, but without the waist seam. 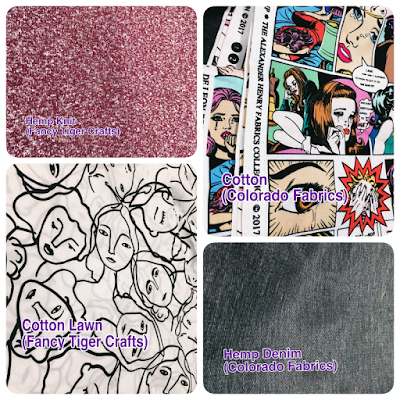 Hey ya'll, check out the last Live Webcast if you missed it..........It's my new setup and video layout to keep you all up to date on what we are sewing and doing. It's called the "SewToFit Live WebCast & Sew & Tell. Set your calendars for the Sew-Along on Saturday, December 22, at 8pm. The FREE pattern download will be up and coming for you to download. The next webcast is December 15th at 8pm, with details on fabrics and pattern download information. I become so embarrassed about my sewing room sometimes. The only reason I share, is that I know, I have been helped many times from the sharing of others. Any tips you may have at this point in my process, please do share. See you on the other side of the internet!!! 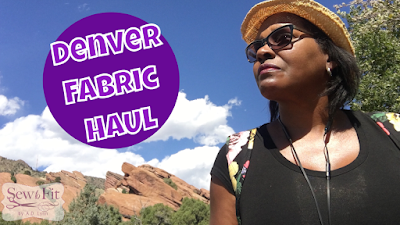 Fabric and Pattern Haul: Denver, CO. 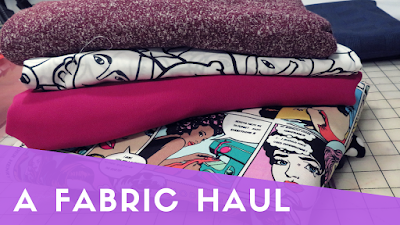 Recently, I did a fabric haul on my youtube channel, about a few pieces I got while traveling. During my trip, I couldn't think of anyone to share my escapades with other than my trusty "online and IRL" sewing community. I was intent on taking pictures, documenting information of the locations and getting all the information on the stores I wanted to visit. I even wanted to remember the names of the associates at each store that assisted me in my quest to explore. My extra time spent from my family during my trip, was focused on sharing. The problem I found with planning a travel haul, was when I got back home. I had all but forgotten everything. I had to comb through all the sightseeing footage in my phone and camera SD cards just to find the pictures and videos from my Instagram-stories and snippets of the short videos I took while "collecting" sewing related memories for you. After I began to edit the pictures and compile a video, my list of notes were nowhere to be found. When I set out to record my video "log", I barely could remember all the names of the fabric I had bought. So, when you watch this video, just use this post to help you fill in some of the blanks and cover items I may have misspoke. I checked out JoAnn fabrics out of habit, and of course had to use a coupon to buy the one item I did like. In the video I mentioned this was a printed ponte, but in reality it actually is a scuba knit. Scuba Knit from JoAnns, Denver, CO. Fancy Tiger Crafts and Colorado Fabrics were the other two I was able to carve time out for on my search of "all the pretty fabric." 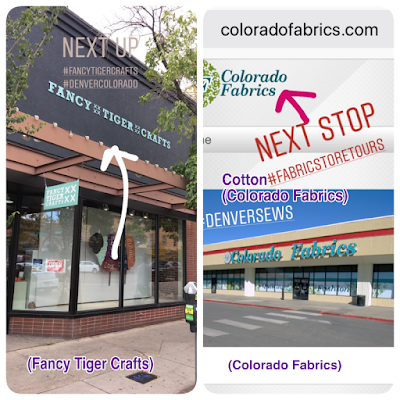 Fancy Tiger was surprisingly packed with nice naturals... as you see in the video, I found all manner of organic fibers, including the hemp knit, silks, soy knits, bamboos, waxed canvas, beautiful cottons and a wide selection of indie patterns. Colorado Fabrics, was a very well stocked store. One I would frequent because of the wide selection of fashion fabrics, including bridal, silks, knits and gorgeous linens, crepes, jacquards, and novelty prints, to mention a few. 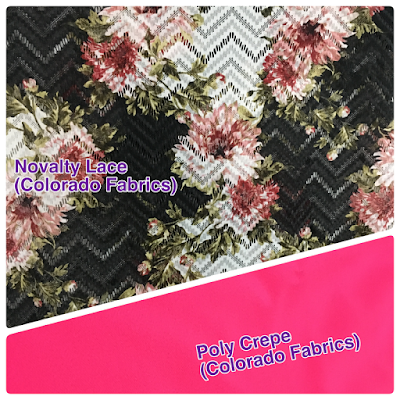 The couple of fabrics in the fabric collage above were what I got, plus one other item that I mentioned in the video, but forgot to give the fabric information: It was this beautiful poly stretch lace that I mentioned making a duster with flare sleeves. I'm sorry, but I really cannot remember the contents of the pink crepe. I do know that they both are poly blends. Fancy Tiger Crafts was a wonderful place for the naturals to be. I loved the selection and the fact that they are to be found online and do deliver. I did breakdown and buy some patterns. WHY, because, as I said in the video..."I just wanted to be like everybody else." LOL yep that is it. I wanted to see what the hype was all about. 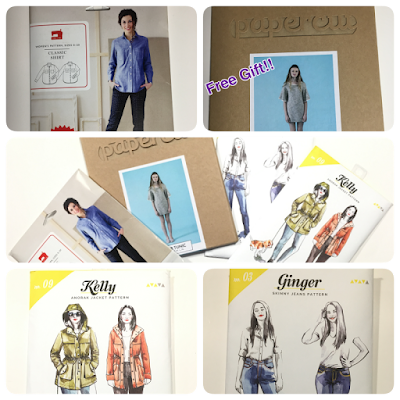 These are the ones I got: Classic Shirt by Liesl &Co, Ginger Jeans and Kelly Anorak, both by Closet Case Patterns. LOL...Funny, but in the video I kept saying Closet Case Files... I must have been thinking about a similar TV show. Oh well!.. I was stoked when the store associate offered me the Papercut, Flutter Tunic as a gift!!! How nice was that!!! 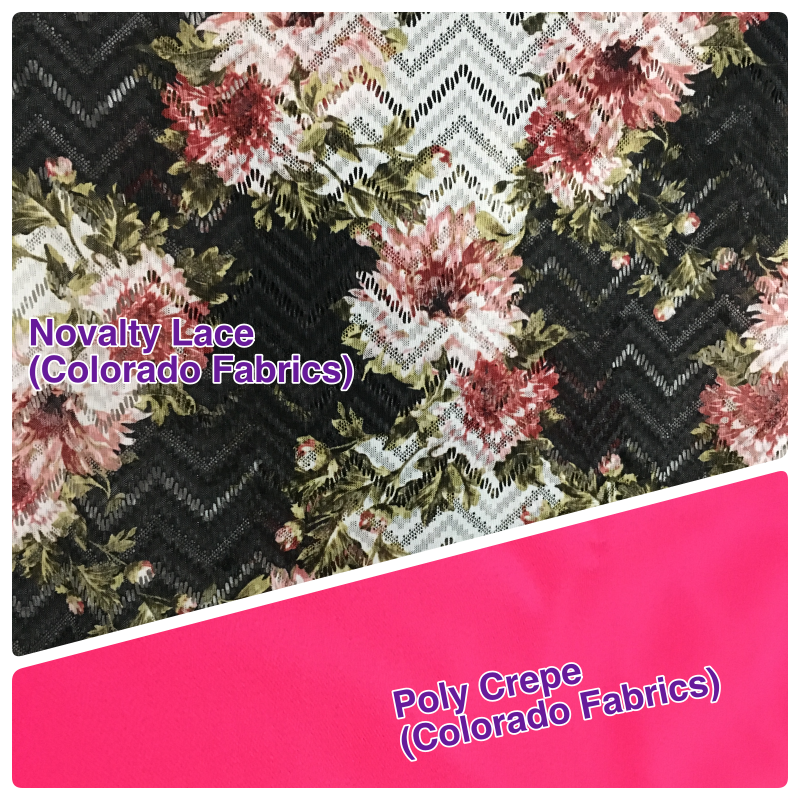 In the video I open the pattern and show all the fun and great details of the packaging and how the patterns are printed. I now wish I hadn't bought the PDF download of the Sapporo Coat by Papercut. I have the right mind to just buy the print version anyway. mmmm....I know thats a waste. But it is so tempting. That packaging!!! Are haul videos or post really that helpful? Let me know, because, I almost don't see the point. LOL Either way, if I don't continue doing them, I still hope you will continue watching and checking out my youtube channel. I have a great time creating all the tutorial videos and always welcome suggestions or feedback in the comments section of each video, or here on the blog. I also know that some of you hate videos, and some of you hate blogs just as much. I also know, that all of you appreciate the work I put into each. I try to keep a balance on both platforms, but when somethings gets overlooked, its nice to hear from you to let me know what I missed. Thanks again for reading and watching. "Until next time.....see you on the other side of the internet.!!" 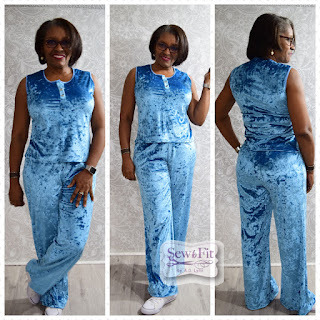 The aim with most of us in the sewing community is to work every day to get that perfect fit and to cross back and forth from one pattern company's patterns to another searching for a well fitted pattern. Would it be politically correct to say, in my opinion, that your search has been misdirected and ill-informed? YouTube Video: Grading -vs- Fit Which comes First? 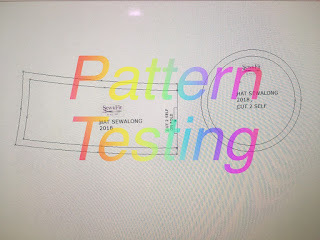 Searching for a perfect solution in a pre-drafted "pattern" which was based on a set of measurements, not your own, is always going to be problematic, thereby, creating never-ending obstacles for the average seamster. Yes, you read that right, Andrea, the tissue fitting, pattern measuring, "sometimes" muslin making, paper slashing/spreading pattern geek just admitted the God's honest truth. Fit is not just checking for symptoms to determine a "fix" for each separate pattern. 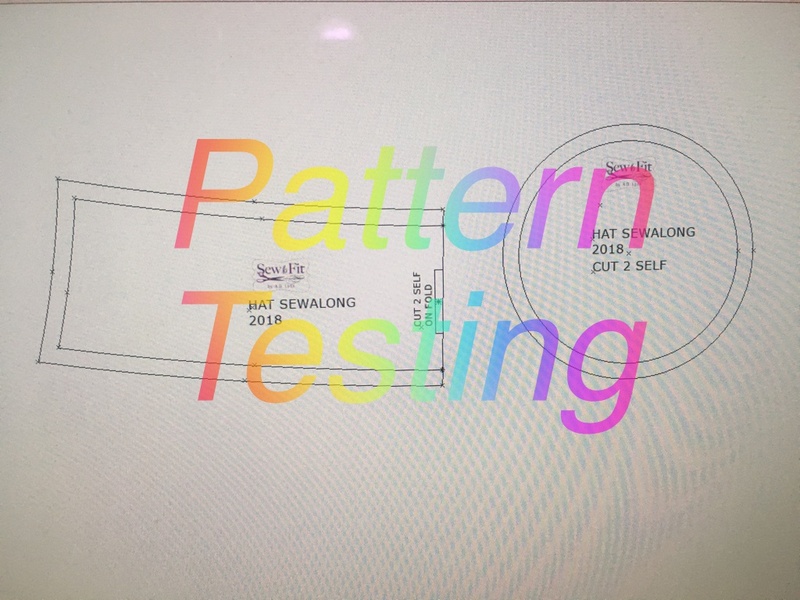 Fit is an intuitive process that is understood only when a connection is made between the flat pattern and the numbers used to draft said pattern. An understanding of the flat pattern is required before you can truly understand and overcome fit as a nemesis, and regard it as a welcoming step in the customizing process that comes only after the flat pattern making is complete. Otherwise, you will be chasing after and falling for the latest and greatest fitting solution. Thereby, pin-holing yourself into a simplistic dependence of "handholding" with no true understanding of the concepts. This hand-holding will limit your full ability to think critically and keep the process from becoming an intuitive extension of your thought process, where pattern drafting and fit become one. My advice is to take the time to learn and understand that formulas are the problem and that you can not get around them as part of the fitting algorithm. Patterns are drafted based on "numbers" which are plugged into an algebraic expression. (i.e. "X+Y=Z") This tells you how to geometrically guide your pencil to the end result of line drawing and connecting dots. The process if exactly the same when numbers are plugged into a custom pattern drafting software. Behind the scenes, there is always an orchestrator guiding the points of the digital pencil. Thus, when you accept a "fit prescription" without fully understanding the foundation of the pattern drafting process, and how these numbers relate to the garment on your body, you become dependent. That is Handholding. You wouldn't blindly accept a doctors prescription medication without understanding the source of your illness and the affects it or the medication has on your body, now would you? I challenge you to take time to learn and understand how these formulas and their affect on the shapes of patterns and the end result of how these lines relate to the different areas of your body. With the understanding of these fundamental concepts, your work with patterns and fitting will come naturally and you will develop a repertoire of fitting solutions. You will begin to apply intuitively the needed adjustments to any situation without dependence and limitation to one form or type of adjustment. i.e. the proverbial FBA. 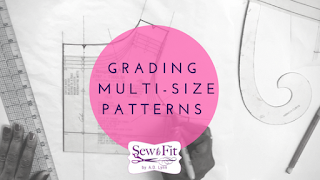 I speak often on pattern grading and how fit relates to the flat pattern, mainly, because they are intricately related when working to customize the flat pattern. 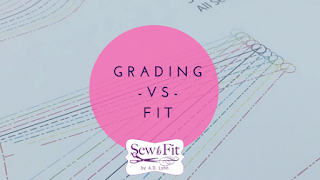 Grading is done, than fit is modified with essentially the same movements of the flat pattern as used during pattern grading. To use only one process or remedy for an "adjustment" is to look through a pin hole, which limits the freedom of seeing the big picture. I suppose you could call that: "Not seeing the forest for the trees." Thats how I see it when I see folks resorting to one form of pattern customization, because that was the "prescription" they received from the doctor. What I believe, is that the absolute only way to get a perfect fit is to understand pattern making and fit in relation to the concept of grading. 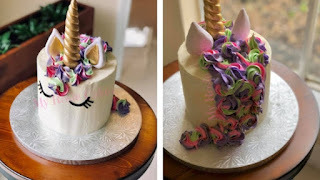 I believe that unless the understanding is reached, then fit will always be as elusive as the Unicorn. I am forced to keep all things in perspective as I read the words of one of my facebook acquaintances. Lemons on my shirt and my first National Cheerleader competition. On a recent visit to Chicago, I had the chance to watch my Mini-Me compete in a National Cheerleading Competition. I am in awe and sad at the same time to see her grow up so fast. The makeup they use for cheerleading didn't help either. But, I must admit, she looks amazing!!! What does Third Place in Nationals look like? The team was incredibly excited to have won city, state and now have the privilege to participate in the national completion for their level. The performance was exceptional, with ZERO deductions on their overall performance. I couldn't believe the things they could do. My Mini-Me is on the support level, and of course the smaller girls get the top tier. OMG...the things all these teams can do, especially the older girls. I packed quite lightly for the trip because I needed to wear the team colors during the completion. 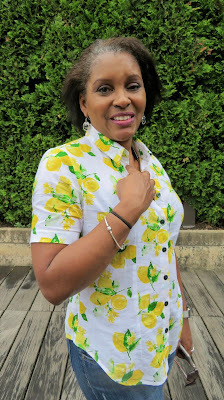 But, of course I had to take my Lemon shirt. As rainy as the weather was, we still ended up having quite a bit of fun checking out the sights. Let's talk about my Lemon Shirt. I found this short cut of fabric buried behind several bolts of stretch woven at JoAnns, with no end tag to distinguish its origins. This 1.5 yards of very lightweight cotton that seemingly handles like lawn could quite possibly be considered a mystery fabric at this point. I didn’t do a burn test and really did not care one bit. I just wanted a Lemon printed shirt. Just know it is extremely comfortable. This is a perfect “shirt block” or shall I say TNT. After my original fit alterations and testing, this one has become my darted block. This base pattern is Vogue 8772 which is a great darted basic that can really be used to create any manner of designs based off this pattern. With this iteration I decided to make view C with the short sleeves and extend the back hem three inches for a more pronounced “shirt-tale” hem. I do not plan to wear it tucked because I really love the hang of the hem. The best part of this trip, was that I finally got a chance to visit Navy Pier, because this is where the entire three day competition was held.